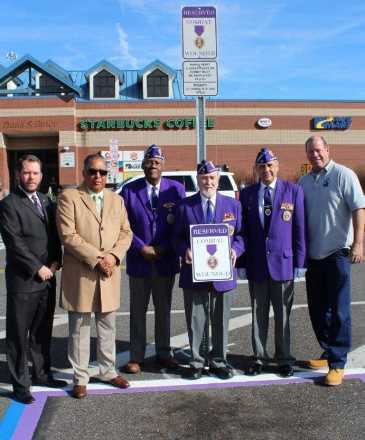 HAMMONTON, NJ – 11-06-18 – The South Jersey Transportation Authority is proud to designate two parking spaces as reserved for holders of the Purple Heart at its Frank S. Farley Service Plaza on the Atlantic City Expressway. In consideration of the approaching Veterans Day observance, the Authority will officially unveil the signs establishing the reserved parking spaces today. Each space is located adjacent to handicap spots and convenient to the front door on both the east and westbound sides of Farley Plaza. Only vehicles owned and operated by a certified Purple Heart recipient with appropriate tags can park in the designated spaces. The Military Order of the Purple Heart is specifically a combat decoration awarded in the name of the President of the United States to members of the Armed Services killed or wounded in action. “We are proud to recognize the service of those who earn a Purple Heart with this small gesture of a preferred parking spot. These designated, reserved spaces will help to remind us all of the sacrifices our veterans have made,” said SJTA Executive Director Stephen F. Dougherty. Approximately 43 veterans work for the SJTA in various locations.